Astrophotographer Cody Limber sent in a composite image of Geminid meteors falling over Boulder, CO, on Dec. 14, 2013. One of the best meteor showers of the year wowed skywatchers during its peak last weekend, and some stargazers took the opportunity to snap incredible photos of the cosmic display. 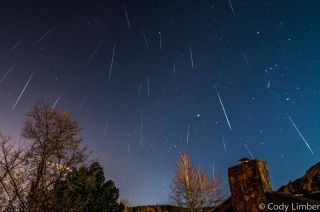 The 2013 Geminid meteor shower put on a bright show during its peak on Friday night into the wee hours of Saturday morning. Before the shower, some experts predicted that people in dark areas could see as many as 90 to 120 meteors per hour during the display's peak. Astrophotographer Tyler Leavitt sent in a photo of a Geminid meteor taken Dec. 14, 2013, outside of Las Vegas, NV. "My wife and I ran outside of town to watch all bundled up with a nice warm cup of coffee," Nevada-based photographer Tyler Leavitt wrote to SPACE.com in an email. "Even with the nearly full moon, we were able to see over 30 in a little over an hour before we started shivering. I really enjoy how much more slowly the Geminids appear to flash across the sky compared to other meteors. Many appeared to have a slight greenish hue to them." Typically, meteor showers are created by particles left behind by comets, but the Geminids are different. The impressive celestial display is created each year as Earth passes through the trail of debris left behind by the 3-mile-wide (5 kilometers) asteroid 3200 Phaethon. "To capture the shot, I set my camera on interval shooting mode starting at about 12:30 and ending at around 3 am," Boulder, Colo., stargazer Cody Limber said of his Geminid meteor shower viewing. "During this time the moon set and the sky became perfectly clear. I was worried that clouds might be a problem because when I looked outside at 9:00 it was completely cloudy but fortunately it cleared up at around 1:00 am and I was able to get the shot." The Geminid meteor shower is named for the constellation Gemini, the part of the sky where they appear to radiate from. While the first signs of the Geminid meteor shower were documented in the 1800s, the intensity of the meteor shower has increased over time due to Jupiter's gravity pulling the stream of debris closer to Earth, NASA officials have said. Editor's Note: If you took a photo of this year's Geminid meteor shower or any other night sky view that you'd like to share with SPACE.com for a possible story or gallery, please contact managing editor Tariq Malik at spacephotos@space.com.